Put a (Background) Spotlight on It! Oh, boy is it HOT!! We've had several days at or almost 100 degrees and I'm a cold weather girl. Always have been. This time of year has me yearning for fall weather. I can't wait for Louisa and her mommy and daddy to get here. They're coming to stay for a couple of days. What are you up to? 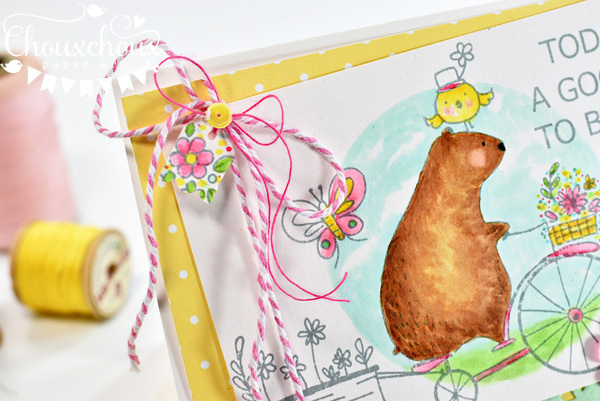 I've been up to bear cards again. This time a cute birthday bear and that same bear couple from my last post, but I got to color them this time. I figured out how to take out the color of the image with a bit of trial and error and a tip or two from a couple of videos. The birthday bear is highlighted with what I'm calling a background spotlight. 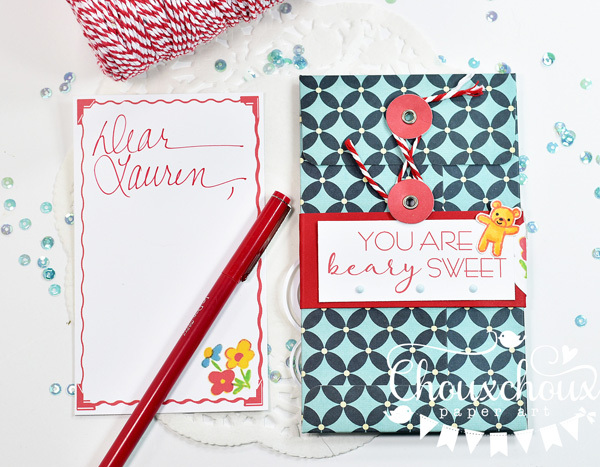 It's super easy to do and adds a fun element to your card. 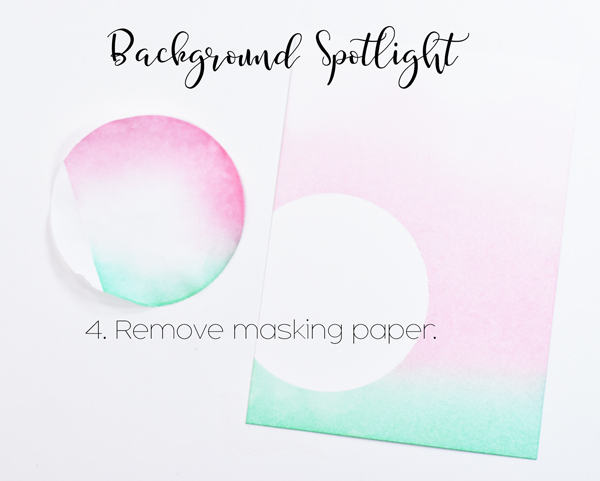 The masking paper makes the creation of a spotlight really easy. 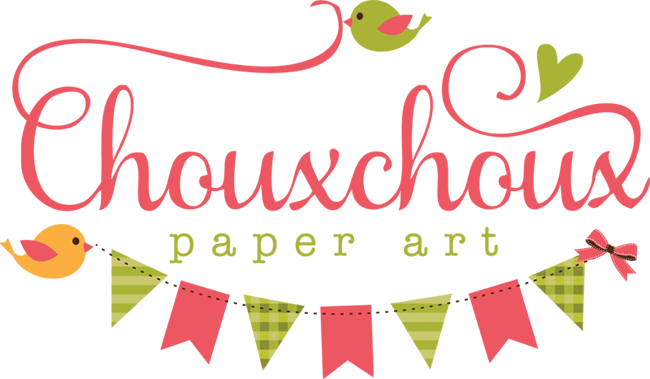 I'm sure you could use a lightweight paper, but the masking paper has the added convenience of an adhesive that's easy to remove. 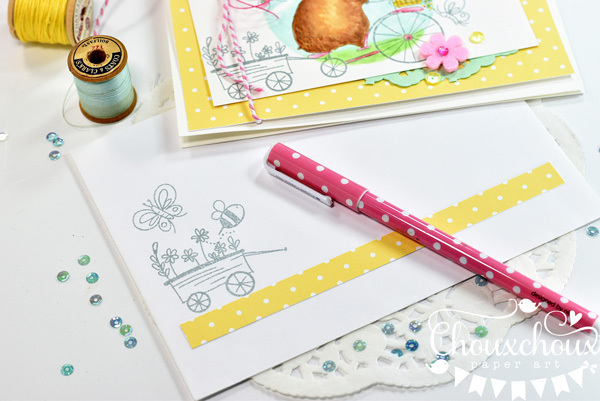 Masking paper is also really thin making it so easy to glide over with the applicators. 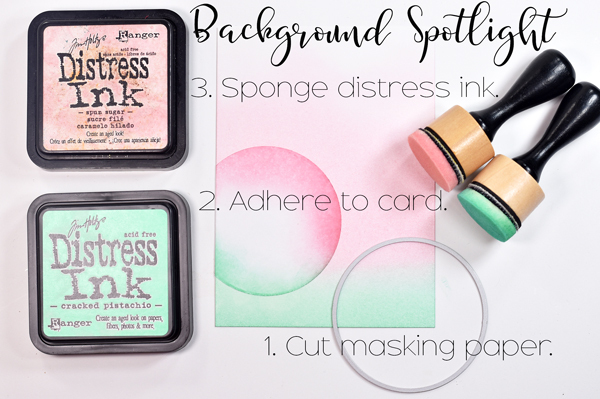 The key here is to use a light touch with the distress inks, so that you can build up color. If you start with a heavy hand you might get way too much color for your liking. I'm sure you don't have to ask how I know that. Let's just say blotchiness is not pretty! I mentioned that the masking paper is lightweight, but it's also strong enough to use a couple of times. I stuck the same piece to the inside of my card. And then stamped my sentiment and another birthday bear in that background spotlight. Don't throw away the trash (oh, excuse me: the negative space). It works great to leave the circle space open, but cover the area around it, so the stamping just shows in the spotlight. I just love this beary sweet couple. They were fun to color too! I split them apart and created a fold-over card using twine to hold it closed. 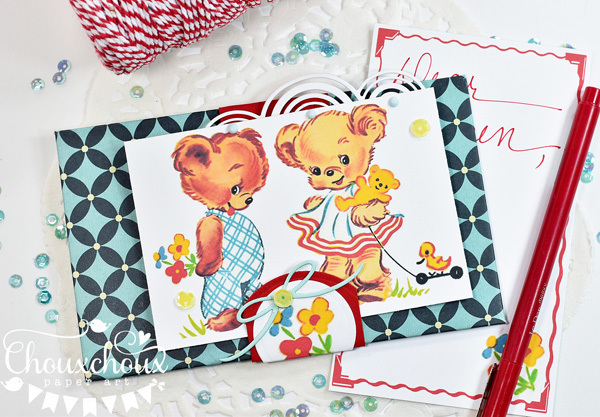 The polka dots on the front and the squares inside were created using stencils, inks and stencil brushes. So soft and pretty. I've got the bear couple for you, if you would like to color them too. 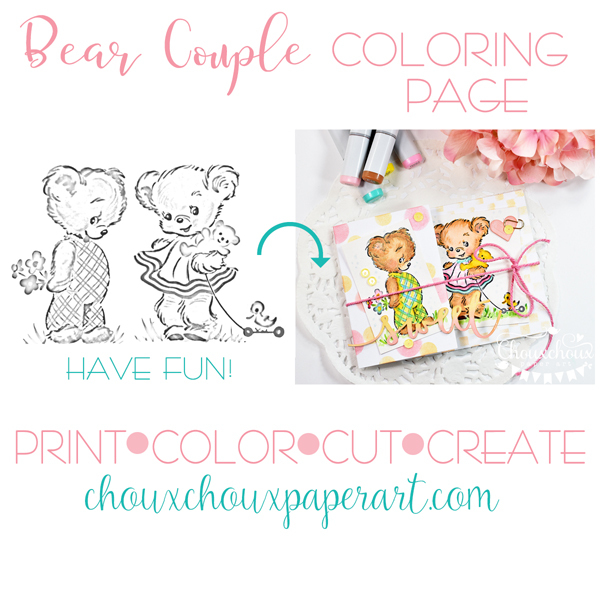 Download Bear Couple Coloring Page HERE. That's it for me. I've got to go open a box full of toys and board books that just came for Louisa. Who is also beary sweet, by the way! 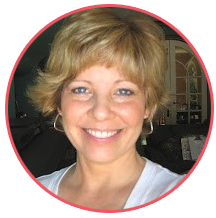 Today is a good day to be happy! We just moved Louisa and her mommy and daddy back to Wichita!!! Now it will be so much easier (and cheaper). Just a two hour drive as opposed to waiting at the airport, flying to Denver, taking a train and then an uber for a total of about 4 to 5 hours depending on traffic. I AM THRILLED. 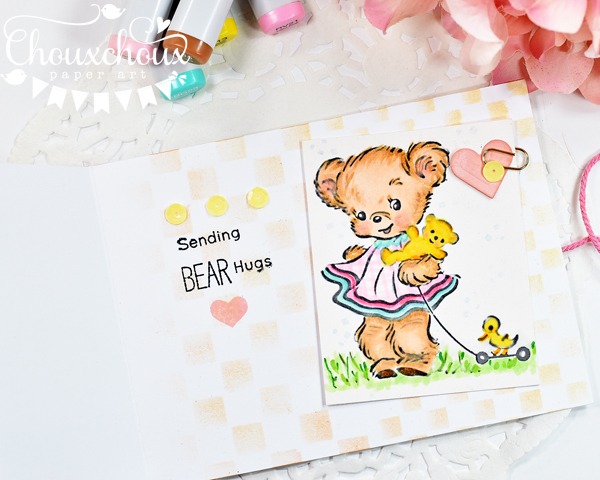 Just finished up this card with that adorable bear featuring the Spotlight Technique. I ran a circle die through my machine on a plain sheet of cardstock, laid that over my stamped picture and just colored within the circle with my copics. What a cool technique! 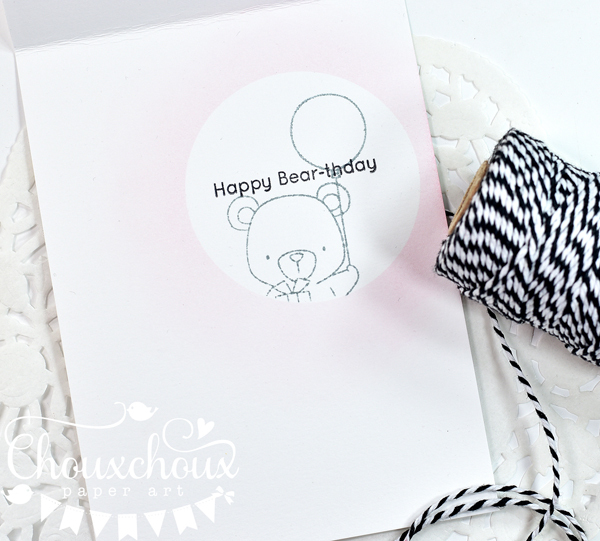 Created a little tag to match the bear's basket and popped that on with some pretty twine. You can just see the back of the decorated envelope in the first pic. 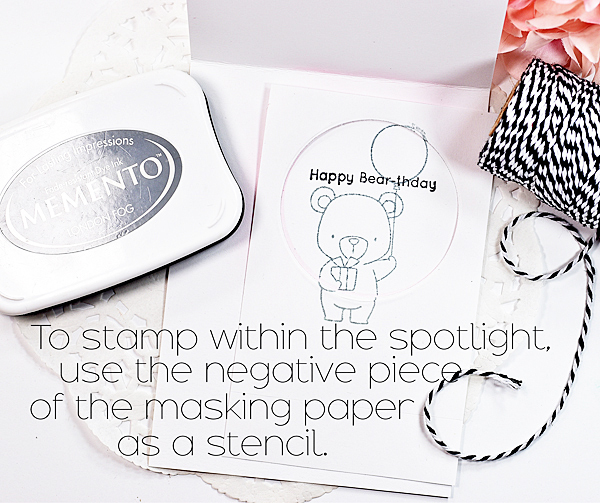 I think this is a cute and easy way to tie the envelope to the card inside. 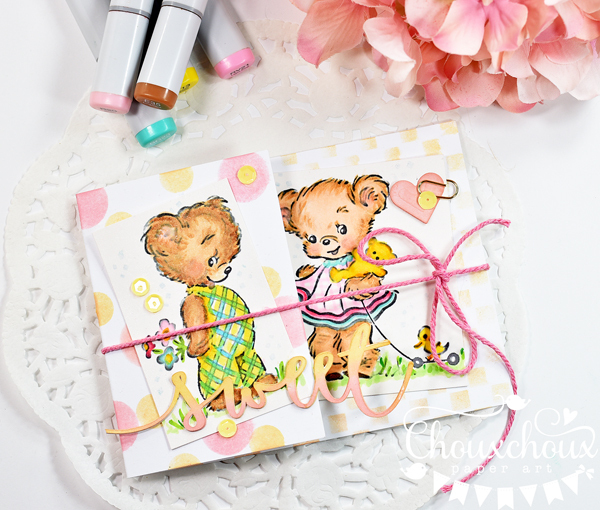 When I finished up the Spotlight card, I remembered that I also had this cute bear couple waiting around for me. I also have a bunch of string-tie envelopes that I rediscovered during the major upheaval to turn my craft room into a nursery. Or a least, get enough room to have a crib in there. 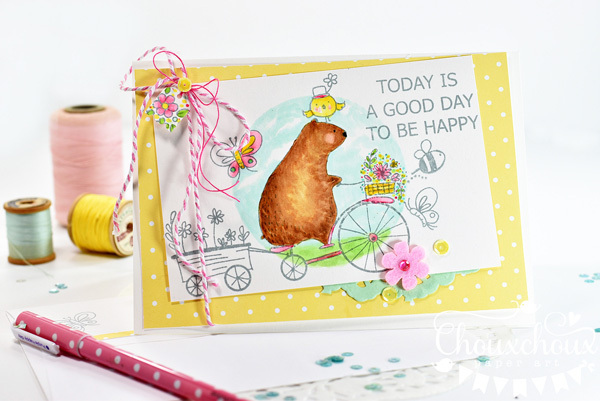 I created a piece of stationery to go along with the bears and a sentiment too. Then I duplicated the little flower bouquet to use on the front. Got lucky that I remembered that cute little bear stamp and colored it to match the little teddy the girl bear is holding. 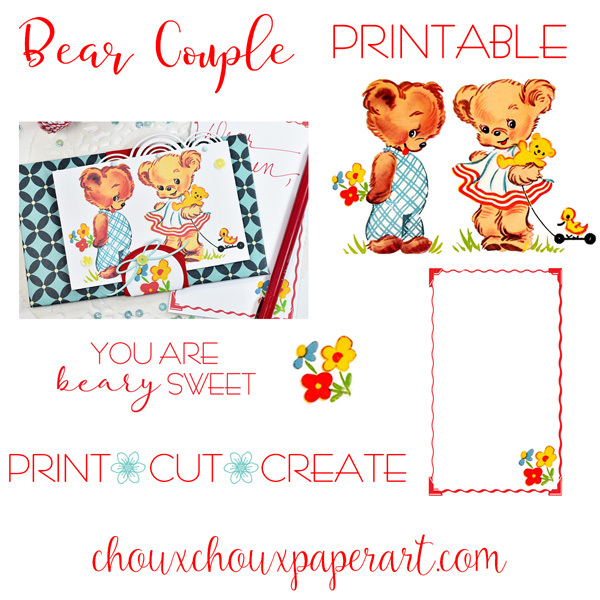 You can download the Cute Bear Couple with stationery sheet, flowers, and sentiment HERE. So here's wishing you a good day to be happy! In fact, make it a good week!